Revise the curriculum to provide a calculus pathway, a statistics pathway, and a quantitative thinking pathway. Many students who would have previously taken college algebra would now take one of two courses: social and behavioral science majors would take statistics, and arts and humanities majors would take a course in quantitative reasoning. Improve college advising through the creation of "meta-majors" with similar core and math requirements, and use multiple measures (beyond a sole placement score) to determine a student's readiness for college-level mathematics. Support and develop instructors to teach pathway courses, especially the increased number of introductory statistics courses that will be needed. Use multiple venues to improve communications about the pathways and their recommended use. With these recommendations in mind, the purpose of the conference was to come together and work on some details of implementation. Colorado has thirteen 4-year institutions and fifteen more 2-year institutions, and a lot of effort over the years has gone into coordinating courses across the institutions to ensure transferability of general education courses. Lieutenant Governor Joe Garcia led off the conference with comments about Colorado's successes in preparing undergraduates and our continued need to prepare more. Reflecting on a particular reform effort during his time leading Pikes Peak Community College, Garcia remembered a proposal to shift from three to four remedial courses prior to a gateway math course. When he looked at the data, he learned that fewer than 10% of students enrolled in remedial courses were actually making it to the gateway course. At Pikes Peak and elsewhere in Colorado, there has traditionally been more focus on enrollment and revenue generation than actually getting students through their programs. For an unfortunate number of students, they find themselves able to complete everything in their program except their mathematics requirement, and that is why the work of the Math Pathways Task Force is so important. Dean Allison, the math department head at UNC, discussed the growing need for graduates to interpret and analyze data. For this reason, he and the task force want to join a national trend that moves away from college algebra as the default math course and towards courses in statistics and quantitative reasoning. This will require a lot of effort on the part of departments, advisors, and instructors. The task force has been working with the Dana Center at the University of Texas at Austin, a national leader in mathematics education who has been working with multiple states on math pathway revisions. Uri Treisman keynoted the conference to describe some of the efforts, trends, and findings he's seen across the country. He said that math was currently under two different spotlights: the first, a harsh spotlight, that shows a lack of completion and high failure rates, and a second, a positive spotlight, where students with skills in mathematics are more successful negotiating rough job markets and becoming upwardly mobile in society. Treisman continually stressed that the reality of today is different than the reality of 10 or 20 years ago. Right now, three times as many students take calculus in high school (almost 25% of all high schoolers) than in higher education, and those students tend to succeed at high rates in college. Studies of transcripts reveal that those succeeding in college calculus almost certainly took calculus in high school. Only about 1% of students going beyond college calculus to a higher level course (like differential equations) started college in college algebra. We've been placing students in college algebra to start them on a path towards math-intensive majors, but almost no students are actually following this path to get there. It's not that we haven't been trying to make this path work, either. 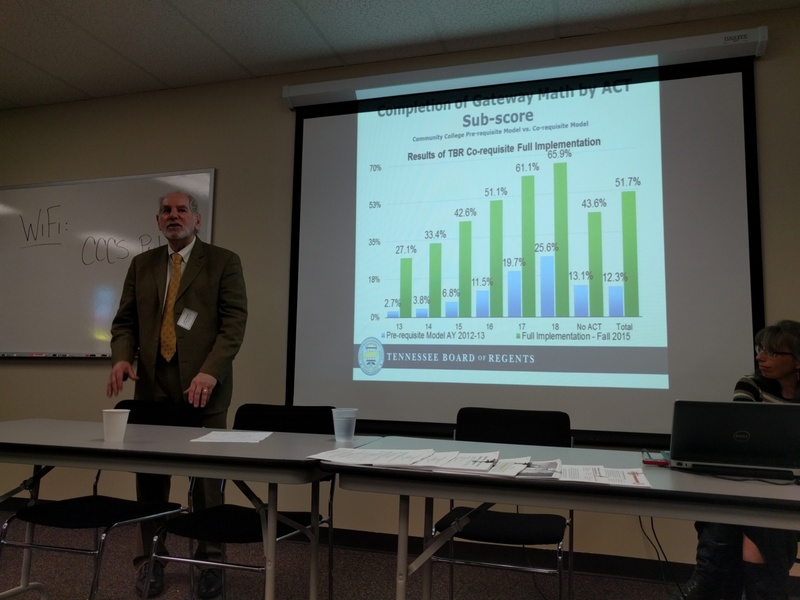 At a meeting of community college leaders in Ohio, Treisman had the group list all the various initiatives for improvement that they've tried. They managed to list a total of 81 initiatives, most of which lasted 2-3 years, and zero of them were sustained long-term. People work hard, but too often people vital to the effort move elsewhere, money dries up, or 4-year institutions don't cooperate. Uri Treisman and Amy Getz, comparing the success rates of a co-requisite support model vs. a pre-requisite support model. Relevance: Too often college advisors accept students' wishes when it comes to course placement, rather than really trying to align the student's interests with the mathematical skills required of various majors. Placement tests haven't helped this, either. Said Treisman, "No longer should a placement test ensure a student is misplaced into a course, supported by a criminal enterprise of testing companies." Acceleration: We've been trying to help students catch up by slowing them down in remedial courses, but we've learned that about two-thirds of students can succeed in regular courses when they're given proper support. There was a belief that these supports would ensure success for all students — a belief that was "polished by hope and unfettered by data" — but we now recognize that to see success for this other third of students it will take a national, Manhattan-type project to figure it out. Narrow the gap between support and instruction: At Northwest Vista Community College in Texas, an advising "SWAT Team" crashes classes to confront students about why they're enrolled in the class they're in. About a quarter say it's because it fit their schedule, not because it's the class they need. They also aggressively supply support to students in the first three weeks of a course, before students slip behind or think there's a stigma about asking for help. Introduce evidence-based strategies into instruction: Treisman says this may very well be the hardest part, yet it's less important relative to the structural improvements needed and described above. Treisman then pointed out some key challenges. For one, math departments need to come to the realization that tradition shouldn't be the dominant force in program design. Math departments also need to push back against other programs, like business schools and psychology departments, who often use math prerequisites to weed students out of their programs. Math departments need to be a partner instead of a service discipline that is often placed as a barrier to student success. As Treisman said, "We no longer want math departments to be a burial ground for tens of thousands of people wishing to better their lives." Amy Getz, also working with the Dana Center, spoke passionately about needed shifts in our thinking. We need to think beyond the classroom and past our old ways of unnecessary prerequisites, predictable outcomes, inconsistent course alignments, and a lack of clear messaging about math requirements. The rest of the day was structured around breakout sessions and whole-group debriefs of those sessions. In the morning, the breakouts were organized around each of the quantitative reasoning, statistics, and calculus pathways. In the "StatsPath" breakout, I learned that the CU-Boulder math department is preparing to drop college algebra altogether, knowing that the easiest way to get advisors to stop recommending it would be to eliminate it. The discussion moved towards the details of the content of a prerequisite course students might take before statistics, but Uri redirected the conversation back to structural elements, which led to good conversations about transfer credits, the need for leadership, and developing the capacity to offer new courses. People in the quantitative reasoning breakout talked about how to work with partner disciplines, while the calculus path group reported on various ways to provide student support. Afternoon breakouts centered on issues of advising, degrees with designation, and on-ramps for under-prepared students. With advising, we talked about the need to coordinate higher ed and high school advising, and to see if the meta-major model really helps advisors and students make decisions about the math courses that align with student interests. The degrees with designation group talked more about working with partner disciplines to determine the learning outcomes they want and why, and putting people in positions to advocate and create change in the system. The on-ramps group focused on issues of communication, including things like email lists, websites, blogs, virtual open houses, and coordinating with organizations like the Colorado Mathematics Association of Two Year Colleges (ColoMATYC), the Colorado Association for Developmental Education (CoADE), the Rocky Mountain Section of the MAA, and CCTM.